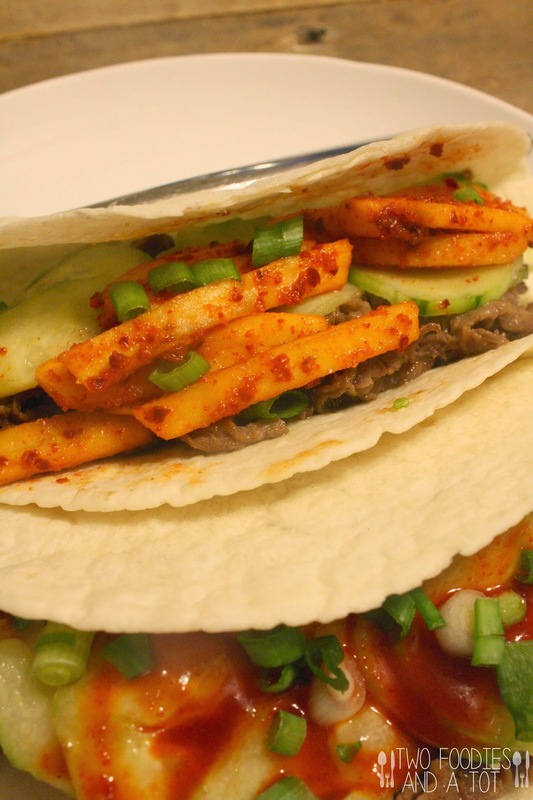 Have you tried Bulgogi taco? There're two very well known Korean taco truck called Korilla in NY and Kogi truck in LA. I am sure there are plenty more but those are the only ones I know. And I have to say, bulgogi and taco is surprisingly totally delicious pairing. Savory, slightly sweet meat wrapped in soft tortilla. Yum. You can use whatever topping you like as any taco style but cucumber quick pickle is a go to topping for me. And apple slaw, I just stumbled upon it. I have always been using the same slaw dressing but usually I use either pear or daikon. I happened to have just apples that day and decided to give it a try and it is delicious! If you want the bright red color of Korean slaw but don't want it too spicy, you can mainly use smoked paprika and a little bit of red pepper powder. That's what they do for little kids in Korea. I actually made a full on spicy version, thinking I just wouldn't give it to my tot but he insisted on having it and I just rinsed it off a little for him. 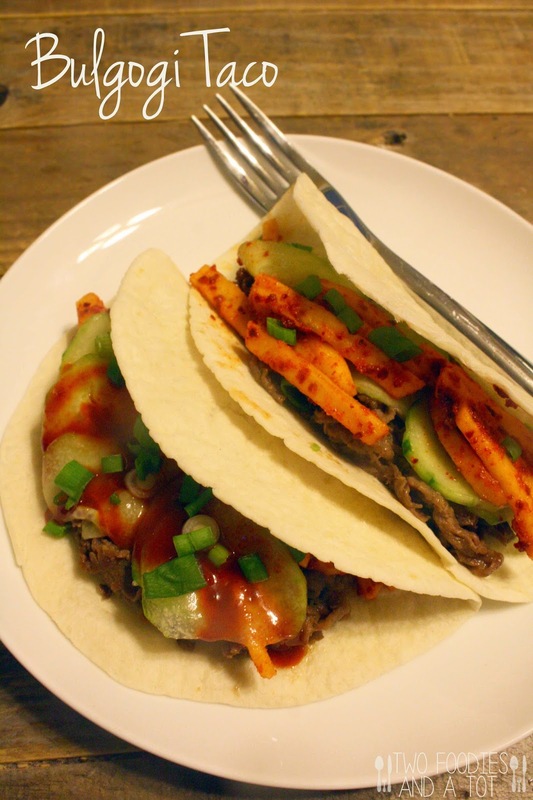 If you prefer milder version of bulgogi taco, you can use sriracha mayo instead of honey gochujang drizzle which Steve did. Traditionally, bulgogi's made with shaved ribeye and I used to make a trip to a Korean grocery store to make it but recently I tried cheesesteak meat and it worked out perfectly. If you feel like trying something crossover or fusion or just simply something different but yummy, bulgogi taco is a good fit! 1. Marinate shaved beef with bulgogi sauce and leave it in the fridge for at least 20 minutes. 2. Meanwhile, make toppings. Stir all the ingredients for honey gochujang drizzle well and set aside. 4. Apple slaw - Sprinkle salt on the julienned apple and mix rest of the ingredients in another bowl. Toss the apple and slaw dressing together and set aside. 5. Cook the meat in a pan for a few minutes. - As it's shaved, it cooks very fast. 6. Warm tortillas and serve with all the toppings. * This goes very nicely with sriracha mayo too.